To most victims, malware is a force of nature. Zeus, Wannacry, Conficker are all vengeful gods, out to punish the common man for clicking the wrong link. Even for a security analyst, it’s easy to fall into the kind of thinking where malicious tools and campaigns emerge out of the ether, forged by an invisible hand. But of course, that’s not true; the world of cybercrime is a fully-formed market, with its own advertisements, discounts, brands, information asymmetries, established vendors and disruptive neophytes. In this day and age, you can assemble a malicious campaign via a shopping list with a fraction of the technical knowledge that was once required previously. Enter Godzilla Loader, a malware being advertised on Dark Web forums, and being actively developed right now. Godzilla fills the “downloader” or “dropper” niche, offering a level of indirection such that the binary that first runs on the victim machine does not contain any of the actual payload, and instead downloads the payload from a remote server. Godzilla is actively maintained, with new features being added periodically, and retails for $500, around a quarter of the asking price of its better-established competitor, Emotet. The opening of the Godzilla Loader ad. This is followed by the list of features and version history. According to our investigation, this marketing effort is running into difficulties. We’ve tried various methods of measuring the number of victims that get hit by Godzilla Loader each day, and all those methods agree that the answer is “not that many”. Even accounting for possible blind spots, the infection rate is almost certainly a tiny fraction compared to the numbers for Emotet. Emotet’s top three features are its lateral movement, its abuse of third-party libraries and its wonky control flow. To better understand how Godzilla Loader’s top features fare in comparison, we’ll look at some of the highlights from the brochure. Early MS-Windows had little in the way of access control, and UAC was introduced in Windows Vista as a stop-gap measure to remedy this. You are probably familiar with the dialogue box prompt that informs you that this-or-another process “wants to make changes to your computer”, which is a layman’s translation for “wants to have administrator privileges”. UAC originally achieved infamy for driving early Vista adopters out of their minds with constant prompts that froze the entire rest of the screen and stole focus from all other applications. Since UAC’s debut, its user interface has seen major improvement, but the same cannot be said for its ability to get in the way of malicious actors. While UAC did present a certain barrier to entry for malware (for example) turning off your AV product, that barrier turned out to be surmountable, with some effort. If you want an idea of what we mean by that, consider the UACME github repository, maintined by infosec personality @hFireF0X; the repository is an educational exhibit which currently lists over 50(!) different attack vectors for bypassing UAC and their corresponding implementations. The battle for UAC as a fully robust security feature has long since been lost. It was nearly a decade ago that Microsoft sighed and declared that UAC is not a Security Boundary. As alluded to in the ad, Godzilla loader comes with a built-in UAC bypass — to be specific, the one described here. This UAC bypass relies on a behavioral quirk in the privileged process eventvwr.exe; when consulting the registry for the location of the Microsoft Management Console, it consults a key which can be modified with no privilege requirements. An attacker can therefore specify whichever executable they please, and this executable will run with administrator privileges. (Let’s not get into the icky discussion of whether this can be classified as a “bug” or a “feature” or a “vulnerability” or what, and agree that this is a Bad Thing). Manifest of eventvwr.exe, including auto-elevate request. If you come away from this piece remembering only one thing about Godzilla Loader, remember that it has a borderline-obsession with COM objects. This functionality was already present in earlier versions of Godzilla. In later versions, the author boasts that they have converted even more of the control flow to rely entirely on COM interfaces; persistence is achieved via the IPresistFile interface and shell executions of programs on the local disk are triggered via the IShellDispatch interface. Godzilla’s first request for a COM interface, among very many. This is a highly unusual stylistic choice, and all the more notable for the consistency across the malware’s core features. By taking this route, the author of Godzilla Loader diminishes the chances of the downloader being caught by behavioral sandbox analysis, and gives his creation some flair that might help it stand out from the competition. One other feature that caught our eye in particular is the automatic deletion of file backup shadow copies on the victim system. For most types of malicious campaigns, this feature won’t make a difference one way or the other; the only possible reason for it being there is to foil a very specific anti-Ransomware measure which operates by recovering the original files from the shadow file backups. To begin with, “recover the shadow files” sits relatively low on the totem pole of anti-Ransomware attacks. On top of that, the vast majority of ransomware will come with this feature built-in; while ransomware authors typically aren’t brilliant cryptographic minds, they have picked up the basics, and the basics have come to include “make sure to delete the shadow files”. Only the lowliest-tier of low-tier ransomware efforts fail to check this tick-box. Who’s the target audience for this feature? That’s a very good question. Godzilla loader employs RSA-2048 to verify the identity of the C&C server — that is, the server response is signed, and the client verifies the signature before acting on the server’s orders. In the event of a DNS-level takeover of the C&C domain, the malicious operation will be down but the domain’s new owner will not be able to issue new commands. It’s a neat little feature, but just a teaser for the full hypothetical power of asymmetric crypto in this context; mostly it makes us think, “God help us all if the ingenuity that produced TOR ever goes into the malware business”. In the feature list, the author boasts of a double-layered fail-safe for C&C communication. First, if communication with the server is not successful, the malware defaults to its DGA implementation; then, if that’s not successful, either, it checks Twitter for a specific hashtag (which is pseudo-randomly generated depending on the day, similarly to the DGA). The campaign controller can announce new C&C sites by generating the hashtag themselves and tweeting the new C&C domain with this hashtag. 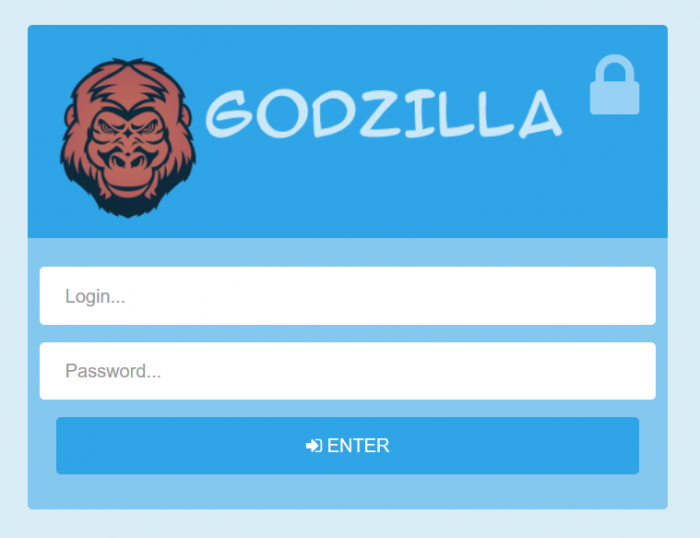 The latest major version of Godzilla, which has been in development as early as December of last year, is set to include a full plugin Ecosystem — including a propagation module, keylogger module and password stealing module. At first glance, the existence and adoption rate of Godzilla both seem to be a simple example of the principle of the Long Tail. Like mobile phone models and programming languages, we expect the popularity of malicious downloaders to follow a Pareto distribution where a few actors dominate most of the market, and the rest is occupied by an ocean of small niche actors. That’s definitely a part of the story, but not all of it. It beggars belief that a sane, transparent market built of fully rational actors would give birth to these two wildly divergent, arbitrarily-priced grab-bags of partially-superfluous features, both aimed at exactly the same target audience with exactly the same needs, with the apparently arbitrary asking price ratio of 1:4 between them. This state of affairs becomes much more understandable once we assume that many campaign managers don’t operate based on an explicit model of malware vs. security at all, but rather on the general knowledge that more obfuscation and better features will shield them from security vendors’ scrutiny. “Without a threat model, there is no security, only paranoia” — this is equally applicable from the attackers’ point of view, and in a market of paranoia, brand recognition holds great sway. Emotet’s feature set isn’t literally worth four times as much as Godzilla’s; it’s worth either much more or much less than that, depending on who you are and what your needs are, as a dastardly cybercriminal. But Emotet’s brand is worth about four times as much as Godzilla’s, or at least that’s the case according to their respective authors’ estimates. Every now and then, an incident response team will quizically stare at a sandbox report, furrow their brow and say, “What is that”. When they furrow their brow, that’s when you know you got hit with a contender from the Long Tail of Malware. Your sysadmin may be horrified, but somewhere out there, some dark-web dweller is thrilled to finally have a customer.